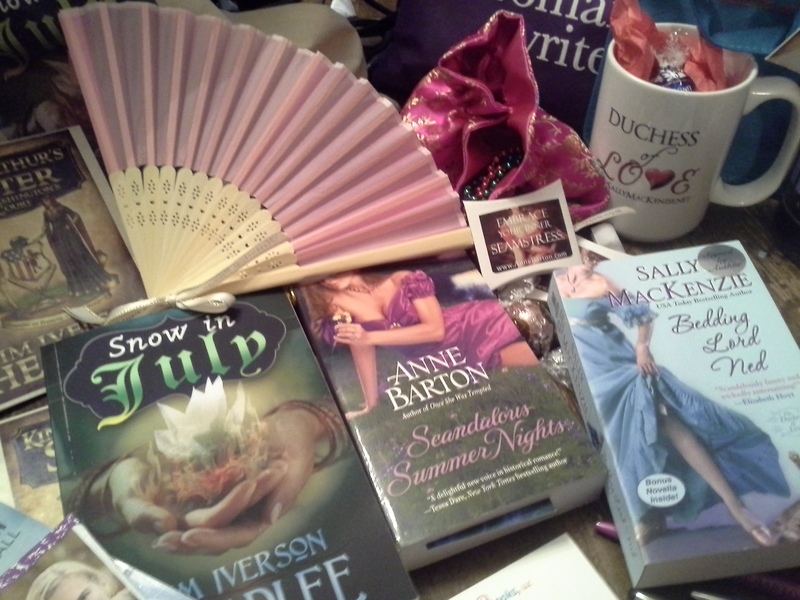 Goodies from my table’s authors. Spent a delightful autumn Saturday with my colleagues from Washington Romance Writers (WRW), the local affiliate chapter of Romance Writers of America (RWA). 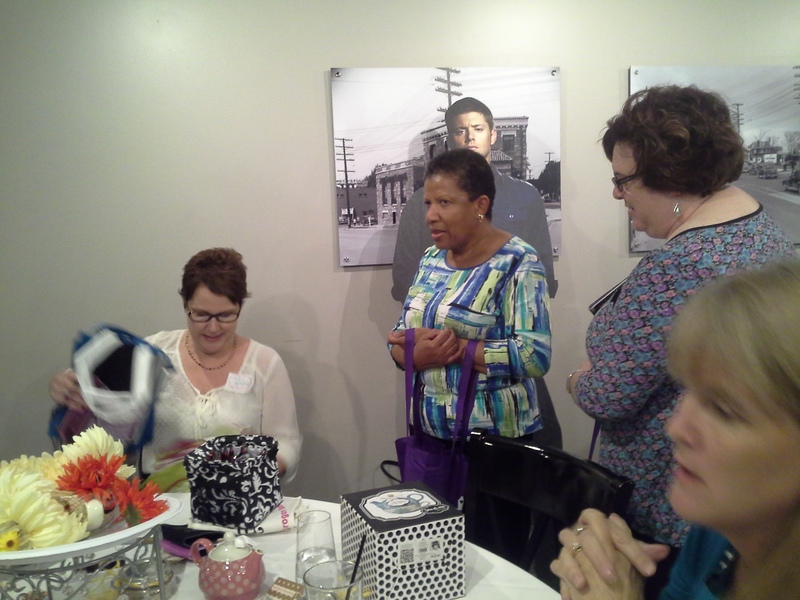 WRW hosted an appreciation luncheon this weekend [October 11, 2014], with 40 authors mixing with50 bloggers and readers called Washington Loves Readers! Authors came in from all over—Tracy Brogan from Michigan, P.A. DePaul from Pennsylvania, and so many more—to help celebrate the bloggers and readers who make their success possible. A list of all the participating authors can be found here on the event’s Facebook site. It was a great afternoon—the food was excellent, with roast chicken, fantastic butternut squash ravioli, and grilled vegetables. Of course, dessert was chocolate cake, because who can argue with chocolate cake!? The luncheon venue was a the cozy upper floor of The Loft at 4935, a restaurant in Bethesda, Maryland, that featured a parking garage right across the street that is free on weekends. 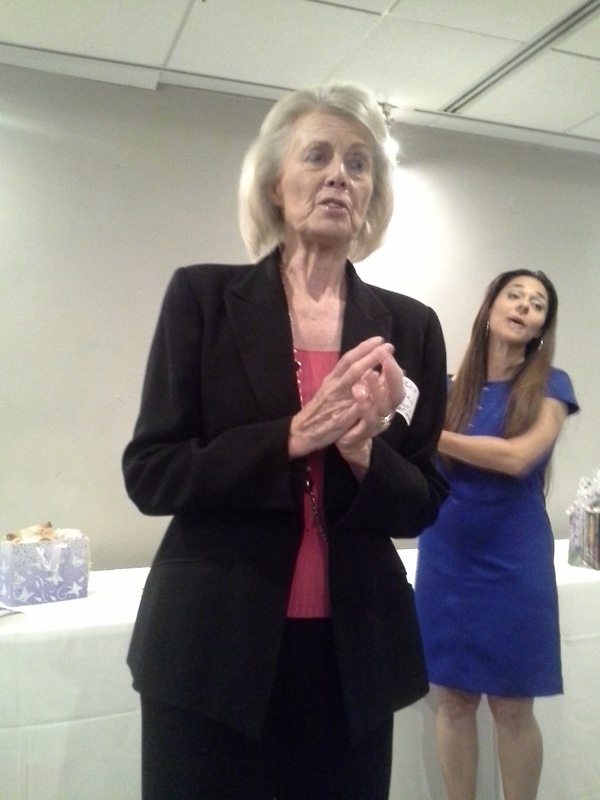 Karna Small Bodman explains her raffle basket (held by Kimberly Kincaid). I attended as a reader and was seated at a table hosted by historical writers Kim Iverson Headlee, Sally MacKenzie, and Anne Barton. Also at our table were two librarians from Maryland and USAToday Happily Ever After (HEA) contributor (and published author) Kathy Altman. Not only did readers and bloggers have a chance to share a table with at least three published authors at their table, but the authors provided goodie bags for their table mates—ranging from signed books, tote bags, picnic baskets, tea cups or mugs brimming with goodies, pens, magnets, and other treats. They also provided centerpieces for the table, showing off the breadth of creativity in the group—it’s worth checking out the Websites or Facebook pages of other attendees and authors to see the array! After a cocktail hour for socializing, we settled in for our excellent lunch. Each course was accompanied by a selection of raffle baskets—something our chapter is famous for. Donated by the authors, with help from their friends or, in many cases, their publishers, these were stuffed full of additional goodies. Bottles of wine, tea pots direct from England, pashmina shawls from India, gift cards, tee shirts, and, of course, books. All of the recipients were excited to hear about the raffle selection from the donating author, who explained what was in the bag, box, or basket, as well as why they chose those items. In some cases, there were twenty signed books in the selection! 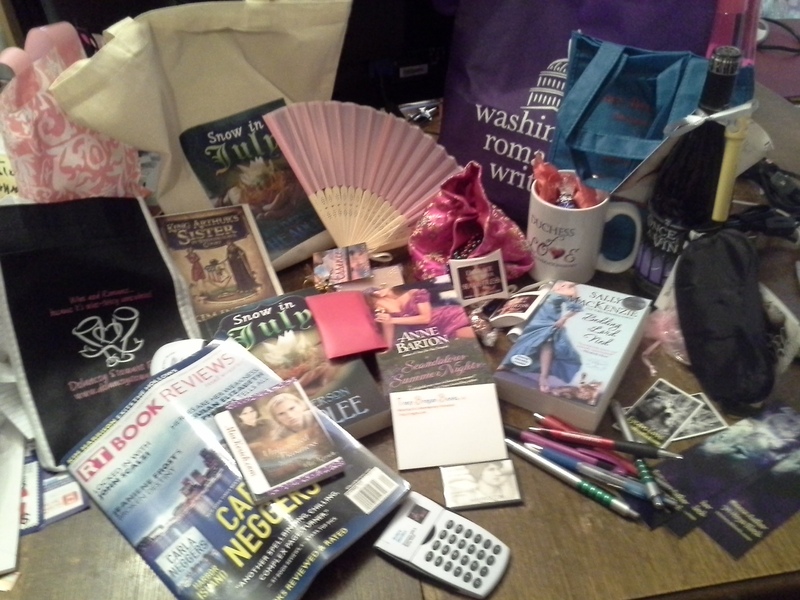 After lunch, the readers and bloggers had an opportunity to use a gorgeous purple tote bag that was a party favor courtesy of WRW to “trick or treat” at the tables and meet each author and collect a variety of author swag, like note pads, 2015 pocket calendars, calculators, scented soaps, and more. It made for a fun way to visit with authors and learn what they were working on and which books are coming out soon. Tracy Brogan passing out treats to fans. Everyone I spoke with said they enjoyed the event, so it’s good to know that the chapter hopes to turn it into an annual or bi-annual affair. I know I’m not the only one who will be looking for further details! Hope to see you at the next one.